Last week was, what's the word... Crap. There were a whole bunch of upsets, which ended with just one of us, TomTomSports, being above .500. When two 5-1 teams face off, there's bound to be fireworks. When the two teams have violent, hard-hitting defense, there's bound to be drama. And when both teams are nursing some serious injuries to key, game changing players, there's bound to be intrigue. The Texans were simply picked apart by Green Bay on Sunday night, allowing 6 passing TDs to Aaron Rodgers and co, and failing to get their league leading run game out of neutral. The two TDs from Arian Foster really camouflaged what was an off game for the OL, who were dominated by the Packers front 7, particularly on the left hand side where LT Duane Brown was beaten time and time again by Clay Matthews, not only in the pass game, but also at the point of attack in the run game, even when Owen Daniels stayed in to help. 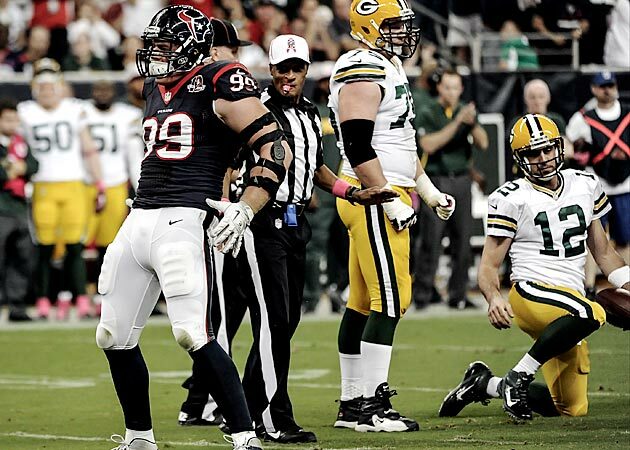 The beating has got a lot of people asking the question, who have the Texans beaten on their way to 5-1? Well, really, not much. Dolphins, Jaguars, Broncos, Titans, Jets. So are the Texans the team we saw beating up on lesser opposition, putting up 38 on Tennessee and 30 on Miami, or are they the team that looked impotent against a team that could actually challenge them? One stat that stood out to me on SNF was that through 5 weeks the Texans had been behind for just 6% of their games, and so had never really had to fight to come back. On Sunday, we saw them try and fail. On top of these problems, they continue to be without ILB and team captain Brian Cushing, who'll miss the rest of the season with a torn ACL, so will rely even more heavily on DE monster JJ Watt. The Ravens, on the other hand, scraped a win over the visiting Cowboys thanks to a missed 51-yard FG with :06 left on the clock last week. It was the 5th time in 6 games that the Ravens finished within a score of their opponents, and the 4th they were within 3 points, not convincingly beating a team since blowing out the Bengals in week one. And for a team that is sneaking its way to victories, losing 2 talismanic figures on the D could easily be the difference in a lot of games. For all that Ray Lewis has lost in terms of speed and physical quickness over the past few years, he's never stopped inspiring his teammates. His torn triceps will likely finish his year, and potentially his career, and will leave a massive hole in the middle of the unit. Perhaps even more harmful to the Ravens season is the loss of CB Lardarius Webb, who has been a standout player for them since bursting into the scene in 2011. Without Webb to look after the improving Andre Johnson, who was one of the few Texans to come out of their GB game looking rosier than they went in, and with Terrell Suggs still a few weeks away from retaking the field, the Texans might be free to exploit the passing game against the Ravens, particularly if their zone running scheme can make the play action a viable option again. Expect huge hits in this one, and undoubtedly a close game. Being in Texas and a 1pm KO will help the Texans, but I think Green Bay exposed some weaknesses in this team that the Ravens will be able to exploit. Ravens win. Game of the week, Cleveland Browns... Those don't look right together, but let me explain. All season I've been sitting down and watching every single game played by a rookie quarterback and giving my week-to-week rankings of their performances. For the most part Indy's Andrew Luck has been very high, and Cleveland's Brandon Weeden has not. So really it's only right that I should pick the first meeting of rookie QB's this season as my game of the week. Last week was a bad one for the Colts, they got run all over by Shonn Greene, which is just embarrassing. Now they face a legitimately talented running back in Trent Richardson, who is expected to go despite having to come off last week with a rib injury. The Browns have also welcomed back Joe Haden at corner, he'll help to slow down Reggie Wayne, which leaves Luck with far less reliable options against what has been a better than expected defense. As for Weeden and the Browns, coming off of their first win of the season into a winnable fixture should have confidence high in the dressing room. There are a lot of weaknesses to this team. All their receivers have had cases of dropitis this year, the offensive line has looked iffy with even the excellent Joe Thomas having his moments. If Indianapolis can get after Weeden with the great duo of Dwight Freeney and Robert Mathis then they can exploit his lack of mobility and cause them serious problems. This game could swing either way, I'm picking the Colts because Andrew Luck is better than Weeden, but there's a reason why the Colts gave up over 160 yards to Shonn Greene, why they couldn't get a touchdown last week and that they managed to lose to Blaine Gabbert. It may seem a bit premature to say this in Week 7, but for at least one of the two quarterbacks in this matchup, this game could end up spelling the end of his season. I'm referring, of course, to former wunderkind-turned-slump king Cam Newton. 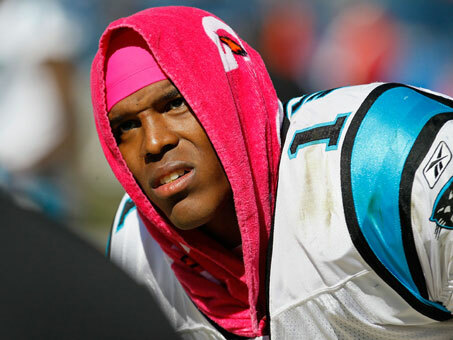 Every since a Week 3 decimation at the hands of the Giants, Newton has responded to the team's losses with ever-increasing immaturity, to the point where he was reported as sitting in the locker room after a game for 15 minutes with a towel over his head, silent, shaking and clearly in tears. On the one hand, it could be taken to show how much Newton cares about winning (although, one might wonder whether he's more upset that the team is losing, or just that he personally isn't playing up to expectations). On the other, though, Newton is meant to be the leader and the face of the franchise. The questions surrounding his maturity in the lead up to his draft, temporarily silenced by his rookie season, are now fairly coming to light again; his inability to contain his disappointment naturally will have a knockdown effect on the spirit of the rest of the team - how are you meant to fight for a quarterback who is only a few more losses away from going foetal on the sideline? The time to prove himself is now for Newton. Coming off a bye-week, the Panthers have had more than enough time to prepare for Dallas, and if that extra preparation time results in a W, then it could mark a turnaround in Carolina's fortunes thus far; but if the team loses, even after an extra week to get ready for the game, then it could be enough to push Newton into complete implosion. But this game is not just one to watch in order to see if Newton can stave off meltdown; while not a must-win, it is a game that, if they lost, could have some grave ramifications for the Cowboys. In a tight NFC East, they can't afford to fall too far behind the other teams, but more importantly, they need to show that they can rise through adversity. Though their defense has been much improved, especially on the back end, they have been struggling with injuries in the secondary, something that the Panthers will no doubt seek to exploit with the always-dangerous Steve Smith. More importantly, this game gives Tony Romo an opportunity to really step up and drag the team to victory. With DeMarco Murray ruled out of this contest, Dez Bryant needing to bounce back psychologically from a high-production game that has nonetheless been marred in the media's eye by two drops, including that crucial would-be game-winning two-point conversion pass, and his own ball security issues (having turned the ball over either through interception or fumble on average three times a game over his last three games), a win here could rally the team around Romo, while a loss - bearing in mind how poorly Carolina has played at times this year - could start to raise a lot of questions in the locker room. Ultimately, for different reasons, these are two teams desperate for a win - and desperation can often lead to the most exciting play on the football field. For that reason, this should definitely be a game to watch this weekend. We’re picking a divisional match-up for the Game-of-the-Week. Ok, so we must be picking the Jets and the Patriots with both teams standing at 3-3. Oh no we’re not! This week, we are taking the Lions at the Bears in the NFC North MNF divisional clash as our big match-up. Why? We’ll tell you why; because this is do or die! (a little NFL poetry for you there). The Lions are 2-3 and sit at the bottom of the division, staring up at the Packers (3-3), Vikings (4-2) and their opponents this week the Bears (4-1). Lose and the Lions are pretty much out of the playoff hunt as the Packers are discovering form again and the Vikings continue to surprise everyone. The Bears will be equally motivated, keen to push the Lions into obscurity and push themselves further ahead in the standings. The Bears also will be looking over their shoulders at the Packers who just handed a whooping to the previously-unbeaten Texans, knowing also that Jay Cutler has serious issues when playing Green Bay. Distance from the Packers is what the Bears need. So, with the importance of this game explained, what are the things to look for? Can the Detroit Lions unearth their offensive form from last year? In 2011 the Lions were phenomenal, with Calvin Johnson and Matt Stafford leading the charge through the air. The lack of a ground game didn’t seem to bother them. Now, however, 99.8 yards rushing per game is just not cutting it. The lack of a running attached has limited Stafford to only 4 TDs this term and Johnson is stuck on a measly 1 TD reception. The Lions need to re-establish the offense fast, or this whole season will be a bust. But we are not sensible men…we are idiots…and we are calling a Detroit win. Why? Because they have to win. This is the pivotal game in the Lions’ season and knowing their coach, their nasty D and never-say-die QB, we think that the boys from Motown my just pull off the upset here. It will probably turn into a shootout, but that is the best scenario for the Lions’ to win. Put a monkey on it; Lions 42 – 39 Bears.